How’s this for an understatement… times are tough! IT organizations are under even greater pressure to “do more with less” and to demonstrate an ROI on everything they do. There is clear proof of concept that IT Service Management (ITSM) best practices can help. 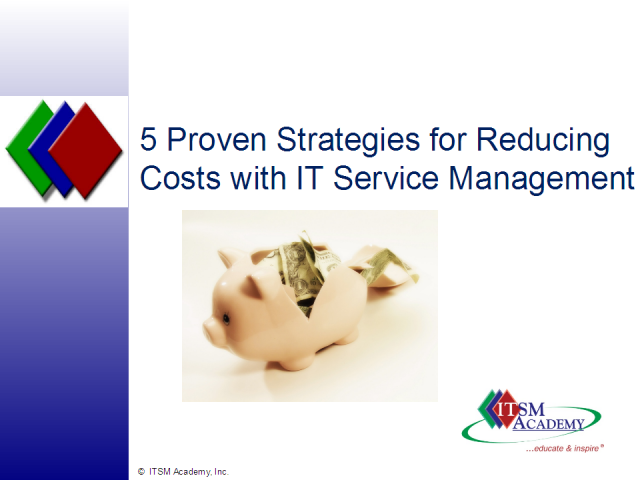 Join Jayne Groll, President of ITSM Academy for an optimistic look ahead and learn five proven ITSM strategies you can use to reduce costs and maximize your resources. Also learn specific ways you can leverage best practice frameworks and standards such as ITIL, MOF and ISO/IEC 20000 to stretch your budget dollars.